“I’ve always had a passion for seeing our city grow and thrive, as well as for what it can become. 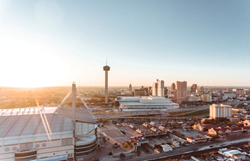 I feel like this agency is a tool that can only help with that and also allows me to play a part in it"
San Antonio native, Daniel Lopez, has opened a new digital marketing agency in San Antonio that will offer services tailored toward rapid customer lead generation for local businesses. The full service digital agency will aid in strategic planning and market research to help clients develop formidable plans for short term and long term business growth. The goal of the agency is to help the businesses that it works with to grow sustainably, but exponentially by at least 25% year over year. In doing so, increased local economy revenue and job creation is what the agency aspires to contribute to and accomplish. The agency has worked with clients in various industries ranging from medical, legal, education, real estate, construction, retail, sports clubs and non-profit. In addition to these industries, Owner and Chief of Strategy, Lopez, has also worked with national brands such as MillerCoors, Hershey's, Smucker’s, Café Bustelo, NatureSweet Tomatoes and regional brands such as CHRISTUS Health, University Health System and VIA Metropolitan Transit. The core digital marketing services offered will include website development, search engine optimization (SEO), search engine marketing (SEM), social media marketing, and online reputation management. BranchLeaf Digital, LLC is a digital marketing agency in San Antonio, led by Owner and Chief of Strategy, Daniel Lopez. The agency helps businesses grow by improving their online presence to outrank their competition and stand out in the crowd. The agency propels companies by creating implementable digital marketing experiences that attract customers. Driven by creativity with a firm foundation in technology, data, and marketing strategy, BranchLeaf Digital, LLC leverages these capabilities to create industry leaders of their clients. The agency is currently accepting new clients.